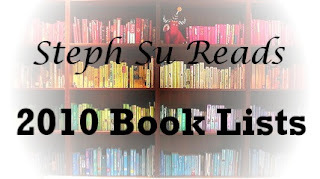 Steph Su Reads: Introducing... the 2010 Book Lists! Introducing... the 2010 Book Lists! It's that most wonderful time of the year again... for scads upon scads of lists! You may remember that last year, around this same time, I did my "Best of 2009" book list feature. You may have found it incredibly annoying, all those lists. You may have loved it. Either way, I love making lists, love that it gives me a way to organize the plethora of books I've read this year. So now I'm back with my 2010 book lists... and they're bigger and better than before, as I've got some wonderful bloggers who have contributed guest book lists! What are the 2010 book lists? They are compiled from the books I've read between December 2009 - December 2010, minus books with a 2011 release date. The books are mostly US-published, with a few from the UK or Australia. The lists are a way for me to share my book recommendations for many of your ever-changing reading preferences. Find a list for every mood! With the exception of guest bloggers' book lists, all lists are of my sole creation and represent my opinion and my opinion only. They are not to be taken as gospel; indeed, they are only drawn from the books I've read this year, and there are plenty of fantastic books published this year that I did not get a chance to read. Please, if you are making your own 2010 book lists, or come across similar features in the blogosphere, do leave a link below in the comments, so that I can add them to this post! Pt. 7 - Craft Etc. Dates are subject to change. The headings above are meant only to give you an idea of what's in store for you on the following days; they do not necessarily restrict the lists posted on that day to that category. I'm looking forward to these posts. I like how you've broken them into categories and have used your reviews to guide some of my book selections. One more thought, Steph, could you update this directory with hyperlinks after you post the installments? I've linked to this post from mine, and it would make it easier for readers to find your posts. Can't wait for this! i loved it last year and am looking forward to it again! I love lists. Can't wait to see what you put on yours! I can't wait for these lists, I love to read through them and it is the time of year I find new bloggers with similar interest. Here's that link you wanted, Steph! I also have Incarceron on it, partially because of your suggestion. THANK YOU for making me want to read its awesome. I just wanted to stop in and say how much I've been enjoying these lists! I've added waaay too many to my amazon wishlist :) So much fun! i'm going through your lists and LOVE htem. Thanks for putting so much effort into compiling them, they rock! Brava, Steph! Thanks for taking the time to read, to review and to link. Looking forward to more in 2011. Wow, your lists are absolutely amazing - thanks so much for taking the time to do them! I've linked to your lists along with some others at my latest blog post at http://yayeahyeah.blogspot.com/2010/12/favourite-books-of-2010-other-peoples.html - I hope you don't mind. 2010 Book Lists, Pt. 7: Craft Etc. "Some of What We Know About Happiness"